Fundraising is a key component of any not-for-profit work, and in an age of ever decreasing local authority budgets, volunteers working in Bristol’s Parks and Green Spaces are having to fundraise from external sources to support their initiatives, community activities in Parks, and improvement projects. 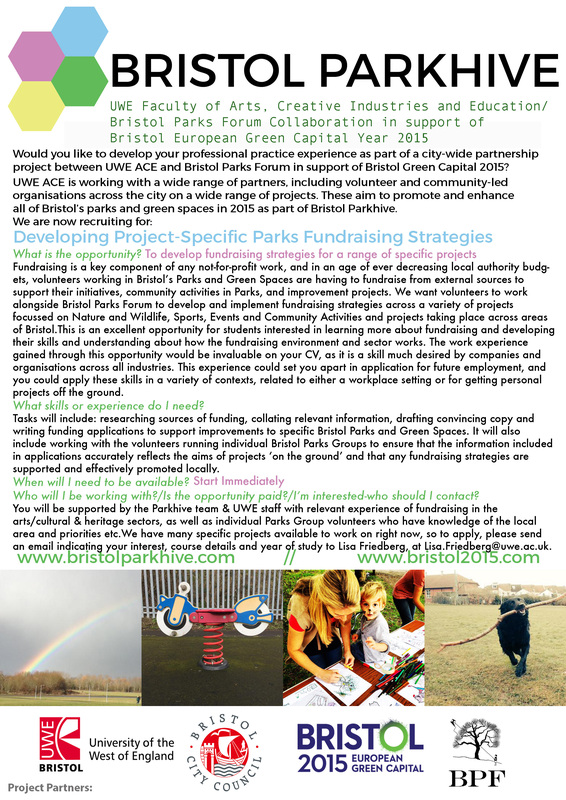 We are looking for volunteers who would like to work with the Bristol Parks Forum (the umbrella organisation for community Parks Groups throughout the city) to develop and implement fundraising strategies for a range of specific projects. These include projects focused on Nature, Wildlife, Play, Sports, Events and Community Activities in parks taking place in areas all over the city. Tasks will include: researching sources of funding, collating relevant information, drafting convincing copy and writing funding applications to support improvements to specific Bristol Parks and Green Spaces. It will also include working with the volunteers running individual Bristol Parks Friends of/Action Groups to ensure that the information included in applications is correct/accurately reflects the aims of projects ‘on the ground’ and that any fundraising strategies are supported and effectively promoted locally. Projects might focus on community access (e.g. funding to enable improved access to local nature reserves), improvements to play facilities, tree planting, wildlife and plant management (e.g funding to install ‘no-mow’ or wildflower planting beds, in local parks), art projects etc. This is an excellent opportunity for students interested in learning more about fundraising and developing their skills and understanding about how the fundraising environment and sector works, i.e. how grants, funding schemes and trusts and foundations operate. The work experience gained through this opportunity would be a valuable asset on your CV, as it is a skill set much desired by companies and organisations across all industries. You will be supported by the Parkhive team & UWE staff with relevant experience of fundraising in the arts/cultural & heritage sectors, as well as individual Parks Group volunteers who have knowledge of the local area and priorities etc. This experience could set you apart in application for future employment, and you could apply these skills in a variety of contexts, related to either a workplace setting or for getting personal projects off the ground. We have a variety of specific projects available to work on right now, so to apply, please send an email indicating your interest, course, and year of study to Lisa Friedberg, Bristol Parkhive Project Coordinator, at Lisa.Friedberg@uwe.ac.uk.